To truly understand a nation you need to understand how it reacts in defeat as well as victory. CBI - China: Day 34 of 41 of the 1st Battle of Shanghai, Manchuria. Chinese troops launch a counterattack but it fails to break Japanese lines. CBI - China: Day 60 of 142 of the 1st Battle of Hebei. CBI - China: Day 9 of 9 of the Battle of Rehe. The Japanese take control of Rebe and the surrounding area. CBI - China: Henry Pu-yi is crowned emperor of Manchukuo by the Japanese. USA: The US Army Air Corps establishes the General Headquarters Air Force as a new formation. This is seen by many proponents of air power as the first move toward establishing an autonomous US Air Force. Germany: The Saarland is officially reincorporated into Germany following the plebiscite vote on 13 Jan 35. Spain: Day 228 of 985 of the Spanish Civil War. Japan: Hideki Tojo is promoted to Chief of Staff of the Kwangtung Army in northwestern China. In four months he will personally lead units into battle in Mongolian border regions with Manchukuo, which will become his only real combat experience. Spain: Day 593 of 985 of the Spanish Civil War. CBI - China: Day 238 of 2,987 of the 2nd Sino-Japanese War. Day 23 of 124 of the Battle of Henan. Spain: Day 958 of 985 of the Spanish Civil War. CBI - China: Day 603 of 2,987 of the 2nd Sino-Japanese War. USA: Undersecretary of State Sumner Welles arrives in Berlin at the start of a peace tour of belligerent countries. UK: Facing shortages of darker dyes for servicemen's uniforms, British women are asked to wear only light-colored clothing. ETO - Norway: Adolf Hitler issues a formal war directive for Weserübung, the invasion of Norway and Denmark. Finland: Day 93 of 105 of the Russo-Finnish War. The USSR's peace ultimatum to Finland expires. MTO - Libya: The Libyan 1st and 2nd Divisions are formed by the Italian Army. CBI - China: Day 969 of 2,987 of the 2nd Sino-Japanese War. Day 108 of 381 of the Battle of South Guangxi. Day 34 of 67 of the Battle of Wuyuan. 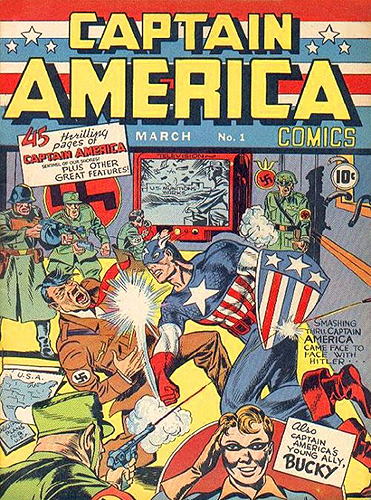 USA: With its finger on the pulse of a growing American sentiment, the premiere issue of Captain America, the intentionally patriotic Axis-fighting comic book hero, sells over one million copies across the country more than nine months before the US enters the war. Although it is dated March 1941, it actually went on sale in December 1940. In the coming years it regularly outstripped the circulation of news magazines such as Time. Child Protective Services would have a big problem today with the dangers in which the Captain placed his pre-pubescent sidekick Bucky, but readers loved the two-dimensional stories that pitted the forces of pure good against pure evil. Superman had been battling thinly-veiled parodies of dictators for months, but great care had been taken to avoid specific references to Germany, Italy or Japan or coming close to mentioning Hitler or Mussolini by name. But after Captain America came along, the gloves came off. 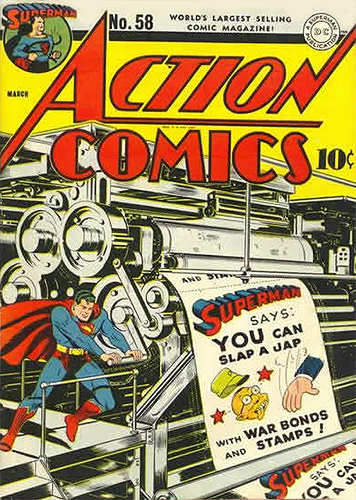 This 1943 cover of Action Comics is a rather extreme example of war sentiment at its height. USA: The Senate votes unanimously to establish a special committee to find and correct problems in American war production. This bipartisan committee becomes known as the Truman Committee, named for its head Harry S Truman. 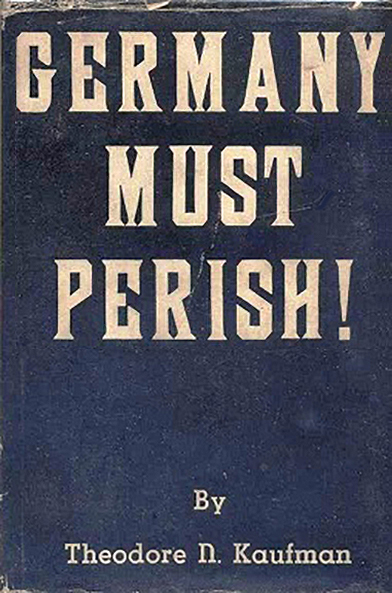 USA: The book Germany Must Perish! is published by Theodore N Kaufman, in which he advocates mass extermination through forced sterilization of the German people and the territorial dismemberment of Germany after an Allied victory. Nazi propaganda will use this book to support their claim that Jews are plotting against Germany. ETO - UK: Day 177 of 258 of the Blitz. ETO - UK: British minesweeping trawler HMT ST DONATS collides with destroyer HMS COTSWOLD and sinks 45 miles east of Grimsby, England. Germany: Himmler visits Auschwitz, ordering the Kommandant to begin expansion, including building a new compound at nearby Birkenau that can hold 100,000 prisoners. MTO - Bulgaria: Bulgaria joins the Tripartite Pact after the discovery of a planned pro-British coup. MTO - Romania: German troops enter Romania. MTO - Greece: Larissa gets hit with a 6.3 magnitude earthquake. MTO - Italy: Italian civilian food rations are cut in half in order to allow food to be exported to Germany. MTO - Libya: Free French forces from Chad capture Kufra in southeastern Libya. East Africa: Day 265 of 537 of Italy's East African campaign in the lands south of Egypt. The 11th African Division push the retreating Italian forces north from Mogadishu, toward the Ogaden Plateau. East Africa - Eritrea: Day 25 of 56 of the Battle of Keren. CBI - China: Day 1,334 of 2,987 of the 2nd Sino-Japanese War. Day 31 of 31 of the Battle of South Henan. The battle ends as Japanese troops withdraw, resulting in a Chinese victory. CBI - Thailand: Day 152 of 221 of the Franco-Thai War (Vichy France vs Thailand). USA: Authorities begin rounding up 112,000 Americans of Japanese descent to move to inland camps well away from the Pacific coast. USA: The War Production Board (WPB) orders that dog food temporarily not be packaged in tin cans, that manufacturers switch to dehydrated versions. Atlantic: Day 47 of 169 of Germany's Second "Happy Time," during which U-boats sink 609 Allied ships with little risk. A US squadron VP-82 based at Argentia, Newfoundland, sinks U-656 off Newfoundland's Cape Race with a Hudson light bomber, becoming the first US aircraft to destroy a German submarine. Germany: The extermination of Jews at Sobibor Concentration Camp begins. Russian Front - North: Day 175 of 872 of the Siege of Leningrad. Russian Front - North: Day 22 of 102 of the Battle of the Demyansk Pocket, another failed attempt to break the siege at Leningrad. Russian Front - North: Day 38 of 103 of the Battle of the Kholm Pocket. Another attempt to break the siege at Leningrad. Russian Front - Center: Day 53 of 103 of the Battle of Vyazma, Russia. Russian Front - Center: Day 53 of 103 of the Battle of Sychevsk, Russia. Russian Front - South: Day 123 of 248 of the Siege of Sevastopol, Crimean Peninsula. All German attacks against Sevastopol are stopped for the winter. CBI - Burma: Day 78 of 164 of Japan's Invasion of Burma. CBI - China: Day 1,699 of 2,987 of the 2nd Sino-Japanese War. Day 68 of 99 of the 3rd Battle of Changsha. CBI - Java: Day 2 of 13 of the Battle of Java. Japanese troops continue landing on the beaches. PTO - Borneo: Day 76 of 107 of the Battle of Borneo. PTO - Java: Day 3 of 3 of the Naval Battle of the Java Sea. Allied Navies withdraw to Australia after getting beaten by superior forces. The battleship USS HOUSTON is sunk. PTO - Malaya: Day 11 of 357 of the Battle of Timor Island, a long guerrilla war ending in Japanese victory. PTO - Philippines: Day 84 of 152 of the 1st Battle of the Philippines. 5th Air Force provides air support. USA: In New York, American Jews hold a mass rally at Madison Square Garden to pressure the US government into helping the Jews of Europe. Russian Front - North: Day 540 of 872 of the Siege of Leningrad. German troops begin evacuating from the Rzhev area. Russian Front - North: Day 20 of 51 of the USSR's Operation POLAR STAR, a failed offensive north of Leningrad, hoping to take the southern shore of Lake Ladoga, Russia. Russian Front - North: Day 301 of 658 of the Siege of the Kholm Pocket, USSR lays siege to the Kholm Pocket but the Germans hold out for a about a year and a half. Russian Front - South: Day 11 of 25 of the 3rd Battle of Kharkov, Ukraine. The Soviets have taken Kharkov but will lose it again. MTO - Tunisia: Day 105 of 178 of the Battle of Tunisia. RAF and US Air Forces provide Allied air support. MTO - Italy: US 9th Air Force B-24s bomb the harbor at Naples and at Soverato, Staletti and Catanzaro. AA fire is accurate and several B-24s are hit over Naples and Palmi. CBI - Burma: Day 71 of 104 of the 1st Battle of Arakan. US 10th Air Force provides air support. The British Chindits begin to move into the Mu Valley. CBI - Burma: Day 22 of 79 of the Allied Operation LONGCLOTH. CBI - China: Day 2,064 of 2,987 of the 2nd Sino-Japanese War. PTO - Alaska: Day 268 of 435 of the Battle of Kiska, Aleutian Islands. ETO - UK: British Wing Commander John Cunningham now has 20 kills and gets a 2nd bar added to his DSO, the first pilot to receive this triple honor. Russian Front - North: Day 48 of 48 of the Battle toward the Narva River, Estonia. The Soviets have reached the Estonian border. Russian Front - North: Day 29 of 191 of the Battle of the Narva Isthmus, Estonia. 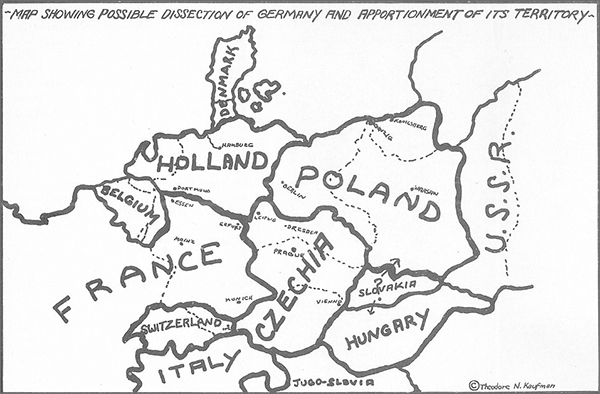 Both German and Soviet troops in the Baltic region go on the defensive. Russian Front - South: Day 69 of 113 of the USSR's Dnieper-Carpathian Offensive in southwestern Ukraine. MTO - Italy: Thousands of Italian workers in northern Italy go on strike, stopping production for a week. As many as 2,000 strike-workers were arrested or deported. MTO - Italy: Day 45 of 123 of the Battle of Monte Cassino. RAF and US Air Forces provides air support for the Allied ground troops. MTO - Italy: Day 40 of 136 of the Battle of Anzio. RAF and US Air Forces provides air support for the Allied ground troops. Middle East: British Commissioner in Jerusalem states that the current quota of 75,000 Jewish immigrants would not be increased and there would be no plan for further openings for immigrants. CBI - Burma: Day 63 of 99 of the 2nd Battle of Arakan. CBI - Burma: The British Chindits cross the Chindwin River. CBI - China: Day 2,430 of 2,987 of the 2nd Sino-Japanese War. PTO - New Guinea: Day 2 of 80 of the Battle of the Admiralty Islands. PTO - New Guinea: Day 165 of 219 of the Battle of Shaggy Ridge. US 13th Air Force provides air support. PTO - New Guinea: Day 162 of 162 of the Battle of the Huon Peninsula. The US and Australia completes their conquest for control of this area. PTO - New Guinea: Day 78 of 597 of the Battle of New Britain. US 10th Air Force provides air support. PTO - Solomon Islands: Day 122 of 295 of the Battle of the Bougainville Islands. US 13th Air Force provides air support. ETO - France: Day 213 of 284 of the Battle of Brittany. ETO - France: Day 168 of 236 of the Siege of Dunkirk. ETO: Day 41 of 66 of the Battle to the Rhine. The US 9th Army capture München-Gladbach and Rheydt, just west of the Rhine. Allied troops liberate Roermond and Venlo in the Netherlands. US 9th Air Force provides air support. ETO - Germany: Day 10 of 36 consecutive RAF night raids on Berlin. ETO - Germany: US 8th Air Force B-17s and B-24s bomb targets in central and southern Germany. Russian Front - Finland: Day 168 of 223 of the Lapland War. Finland and Russia have joined forces to kick the Germans out of Finland's most northern province. Russian Front - Center: Day 138 of 206 of the Battle of the Courland Pocket in Latvia. Russian Front - Center: Day 36 of 75 of the Battle of Königsberg, East Prussia (now Kaliningrad, Russia). Russian Front - Center: Day 35 of 63 of the Battle of the Heiligenbeil Pocket in East Prussia. Russian Front - Center: Day 20 of 54 of the Battle of East Pomerania, Germany. German troops recapture Lauban, Germany (now Luban, Poland). Russian Front - Center: Day 17 of 83 of the German Siege of Breslau (today Wroclaw, Poland). Russian Front - Center: Day 29 of 31 of the Battle of Schwedt, Germany. MTO: US 15th Air Force B-17s and B-24s bomb in Austria and Yugoslavia. CBI - Burma: Day 42 of 61 of the Battles of Meiktila and Mandalay. The US 10th Air Force provides air support. CBI - Burma: Day 26 of 99 of the Battle of Pakokku and Irrawaddy River operations in central Burma. The US 10th Air Force provides air support. CBI - China: Day 2,795 of 2,987 of the 2nd Sino-Japanese War. CBI - Java: Japanese hospital ship HIKAWA MARU hits a mine in the Singapore Strait en route to Manila, Philippines, but manages to arrive. PTO - Formosa: US 5th Air Force attacks industrial targets in Formosa and on a three islands in Borneo. PTO - Japan: Fighter planes from the USS HANCOCK attack at Amami Oshima on the Ryuku Islands, Japan. PTO - Japan: US 7th Air Force attack targets in the Bonin Islands. PTO - Japan: Day 11 of 36 of the Battle of Iwo Jima. US 7th Air Force provides air support. PTO - New Guinea: Day 430 of 597 of the Battle of New Britain. US 10th Air Force provides air support. PTO - New Guinea: Day 314 of 481 of the Battle of Western New Guinea. US 10th Air Force provides air support. PTO - Philippines: Day 133 of 299 of the 2nd Battle of the Philippines, aka the Liberation of the Philippines or the Philippines Campaign. PTO - Philippines: Day 77 of 244 of the Battle of Luzon. 5th Air Force provides air support. PTO - Philippines: Day 27 of 29 of the Battle of Manila. US Marines land on Verde Island, to the southeast of Manila.